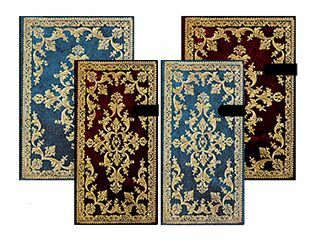 Regal tones and a pedigreed history make our Jewel of Urbino journals exactly the thing to add a touch of pomp and a flourish of extravagance to your life. The original binding hails from Urbino, the legendary walled city in the Marche region of Italy, and was printed in 1755. The text inside was translated into French by the Princess Maria Anna Matilde. The medieval city of Urbino is located high on a steep slope and is a designated World Heritage Site. When Cardinal Giovanni Albani of Urbino ascended to the papacy in the earliest part of the 18th century, he and his family made sure that their city benefitted. Buildings, churches and monasteries were renovated and that investment has led to a city that remains a crown gem among Europe's oldest settlements. Our Jewel of Urbino journals are riches for the eye and for the spirit.